Busker Busker held 25 concerts in 18 regions! Following Busker Busker vocalist Jang Beom june's latest release of his new song killed all the chart and the first nationwide tour concert in three years will also show unusual ticket power and hold additional performances in the Seoul area. Jang Beom june is scheduled to hold a national tour from April, has decided to add a tour area, including the first performance in Seoul. The Seoul performance is close to selling the entire round shortly after the ticket opening, proving once again Jang Beom june's ticket power. In response, he thanked many who were interested in the performance and decided on April 12 to hold another performance to welcome the spring with more audiences. This will allow five performances in Seoul to be held from April 6-7 at Blue Square I Market Hall in Yongsan-gu and a total of five times from April 12-14. Tickets for the April 12 concert, the additional host, will be open at 2 p.m. on April 29. In addition, the tour area has been confirmed after much consideration, as there have been continuous requests for the event in areas not covered by the venue. With the addition of Anyang's July 27 concert, the tour has expanded from a total of 17 regional and 23 performances to a total of 18 regional and a total of 25 performances. Jang beom June released his first new album "Jang Beom june's 3rd album" in about three years on 21, has shown a strong presence in the music industry, jumping as No. 1 on all real-time music charts in Korea right after its release. 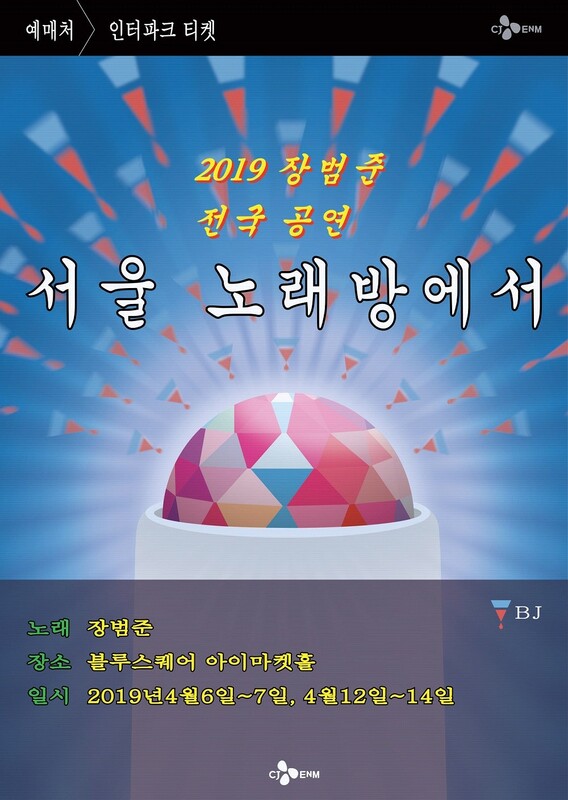 Since this concert is also the first national tour concert in three years, the company plans to become a "Performance master" through a highly completed stage..
Tickets for the "2019 Jang Beom june National Concert <Karaoke>" in Seoul will be open exclusively through Interpark at 2 p.m. on 29, and tickets from other regions will also be available for reservation through Interpark.